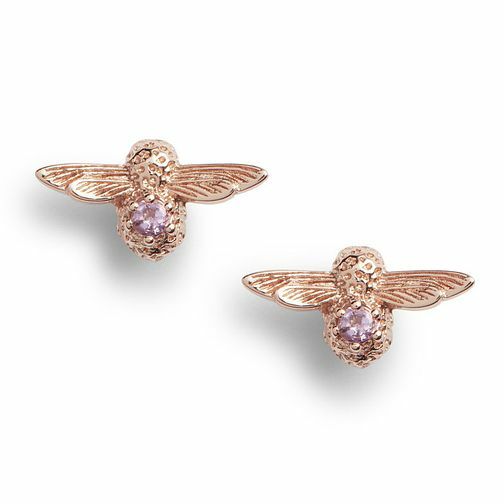 Olivia Burton presents her signature bee motif upon these stunning stud earrings. Crafted with rose gold plating, the intricately detailed pair feature a gleaming amethyst upon the bodies for an extra opulent touch. Enhance your everyday outfit with a stylish shimmering set of studs by Olivia Burton today! Olivia Burton Bejewelled Bee Rose Tone Amethyst Earrings is rated 5.0 out of 5 by 1. Rated 5 out of 5 by Anonymous from Beautiful bees Lovely item. Slightly smaller than expected but all the better for it. Love the rose gold and amethyst together.